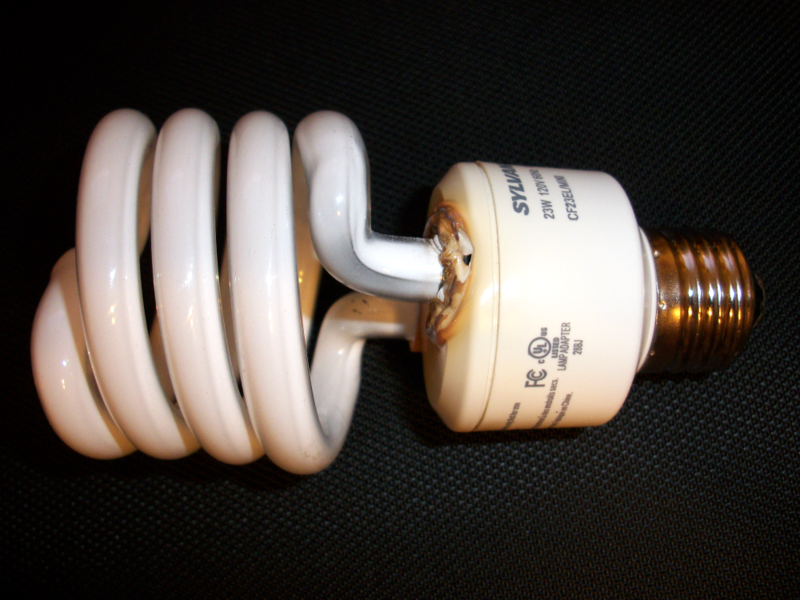 This particular bulb is a 23W Sylvania product used in a fixture that includes a ceiling fan. In the fixture, the bulb pointed down at about a 45-degree angle and was surrounded by an open-ended globe. Almost certainly, heat buildup was at least in part responsible for the failure of the lamp. Notice how he housing is melted in the picture. I don’t have the packaging from this particular compact fluorescent, but I think the lifetime claims for most such lamps are similar: 6 years or 10,000 hours. That comes to about 4.5 hours/day. I’m pretty certain this bulb did not last 10,000 hours.